1) What was your father's birth date? 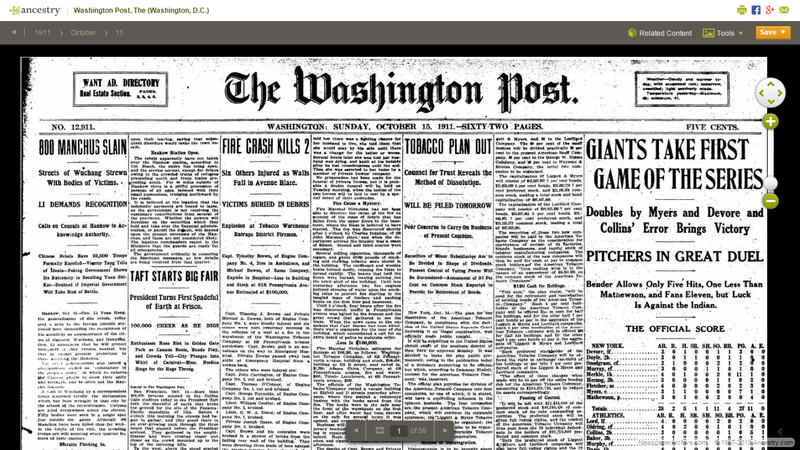 2) Find a newspaper from his hometown, or a nearby larger town or city, that was published on that date. What was the major headline on page 1 of that issue of the newspaper? 3) Share your headline with us in your own blog post, in a comment on this blog post, or in a Facebook or Google+ post. NOTE: For those who don't have access to digital newspapers behind a subscription wall, find FREE digital newspapers using Miriam Robbins' Online Historical Newspapers site - https://sites.google.com/site/onlinenewspapersite/. 1) My father's birth date was 15 October 1911, in Fitchburg, Massachusetts. The major headline is: "Mackmen Win Second 3-1." This refers to the 1911 World Series, where the Philadelphia Athletics beat the New York Giants 3-1 in the second game on a home run by Frank "Home Run" Baker. 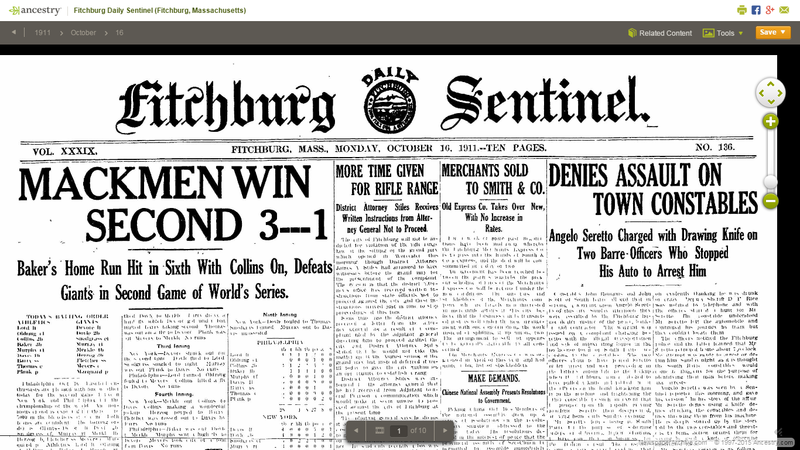 "Doubles by Myers and Devore and Collins' Error Brings Victory"
"Bender Allows Only Five Hits, One Less Than Mathewson, and Fans Eleven, but Luck Is Against the Indian"
The headline doesn't tell the score, but the article says it was 2-1 in favor of the New York Giants. This game had the largest crowd to ever see a ballgame, with 38,281 spectators in New York. Unfortunately, the FREE Chronicling America (http://chroniclingamerica.loc.gov) site doesn't have any Boston newspapers for that time period. 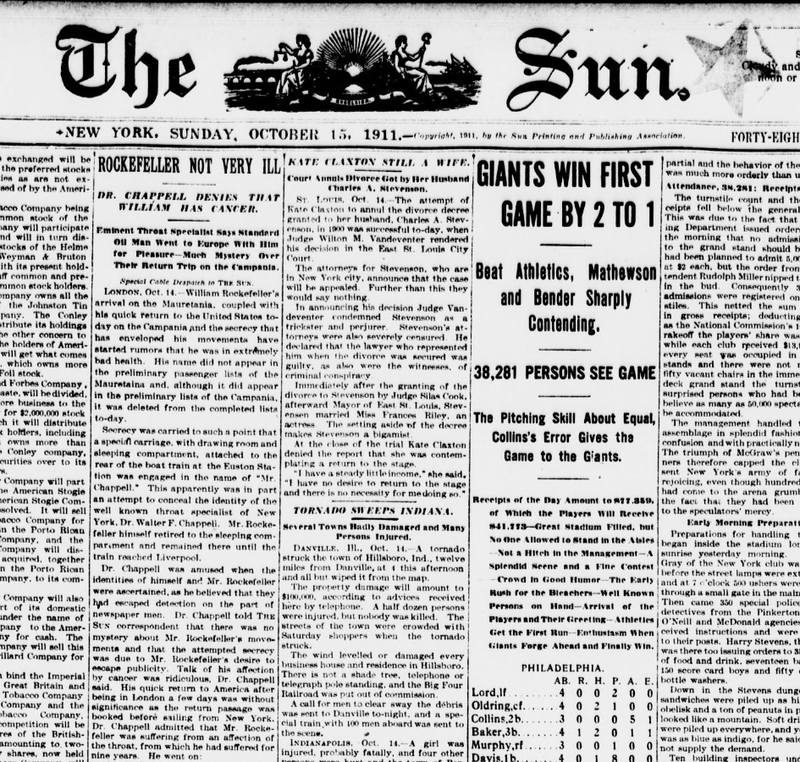 "Giants Win First Game By 2-1"
Another headline on the page is "Rockefeller Not Very Ill."
I guess it's only fitting that my father loved to play, and coach, and watch, baseball...after all, he was born during the World Series. Of course, this was before radio and television, and the only way people knew the outcomes, unless they attended the games, was in the newspapers the next day. I am in the 8th great-grandmothers and I'm up to Ancestor #1101 who is Mary Allen (1641-1702) [Note: the earlier great-grandmothers and 8th great-grandfathers have been covered in earlier posts]. 1100. Joseph Clark, born 27 July 1642 in Dedham, Norfolk, Massachusetts, United States; died 04 September 1702 in Medfield, Norfolk, Massachusetts, United States. He was the son of 2200. Joseph Clarke and 2201. Alice Fenn. He married 25 June 1663 in Medfield, Norfolk, Massachusetts, United States. 1101. Mary Allen, born 11 December 1641 in Dedham, Norfolk, Massachusetts, United States; died 05 May 1702 in Medfield, Norfolk, Massachusetts, United States. * Joseph Clark (1664-1731), married (1) 1686 Mary Wight (1667-1705); (2) 1706 Abigail LNU. * Esther Clark (1670-1703), married 1693 Thomas Thurston (1658-1704). * Solomon Clark (1678-1748), married (1) 1698 Mary White (1675-1740); (2) 1740 Elizabeth Adams (1693-1766). * David Clark (1680-1714), married 1703 Mary Wheelock (1686-1714). * Aaron Clark (1685-1759), married 1705 Mary Morse (1685-1771). 2203. Anna Guild, born about 1616 in Scotland; died 29 March 1673 in Medfield, Norfolk, Massachusetts, United States. * Mary Allen (1641-1702), married 1663 Joseph Clark (1664-1702). * James Allen (1646-1691), married (1) 1670 Elizabeth Partridge; (2) 1672 Lydia Adams (1653-1731). * Nathaniel Allen (1648-1718), married (1) 1675 Mercy Sabin (1652-1677); (2) 1677 Mary Frizzell (1656-1746). * Joseph Allen (1654-1703), married 1673 Hannah Sabin (1654-1729). 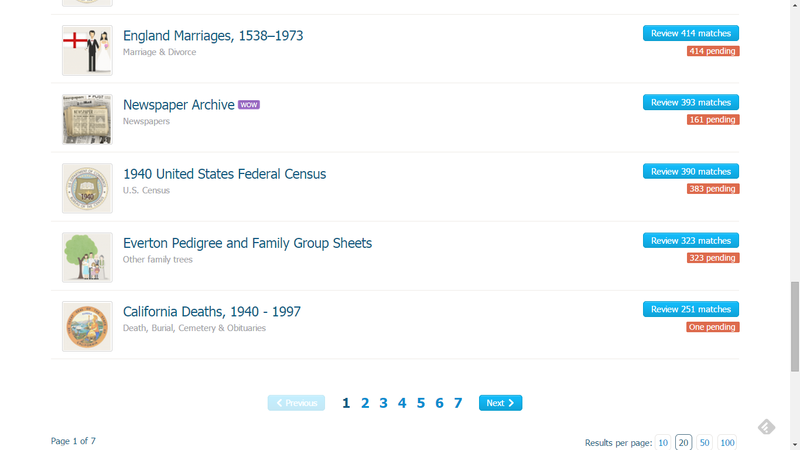 I checked my MyHeritage Record Matchesd today, and was happy to see that there are matches from 135 record collections and a total of 69,776 record matches (67,046 are pending). I don't see Find A Grave here, I wonder if they don't provide access to it any longer? It was on this list a year ago. Probably because Ancestry.com now owns it. I'm glad I mined it in 2013-2014! 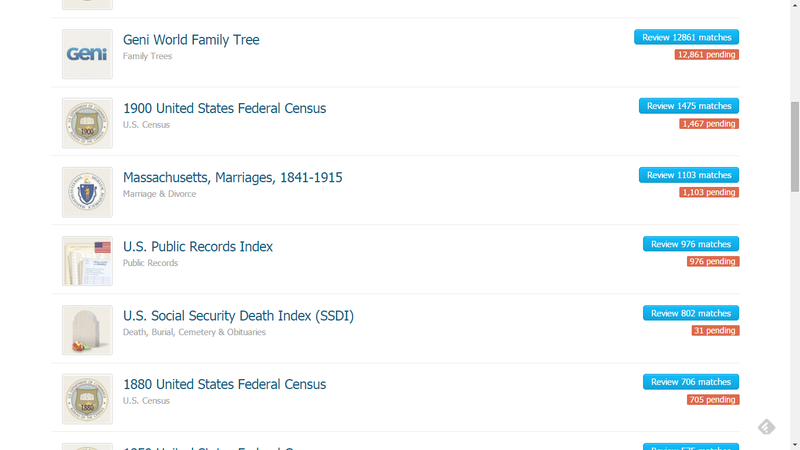 A good number of the Geni, WikiTree and FamilySearch Family Tree are my own entries, so I'm not going to bother much with them. 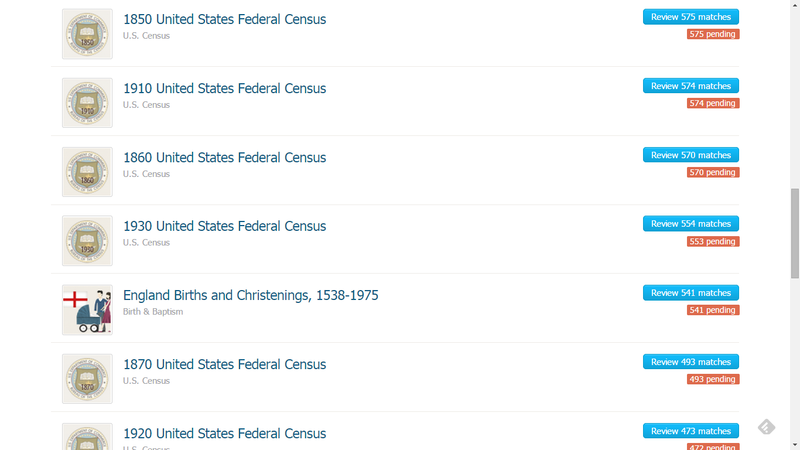 I am doing the U.S. Census records from the Ancestry Member Tree Hints so I won't bother with them either. I will look carefully at bthe Newspaper Archives lists (I think MyHeritage is the only site that provides Hints for a newspaper collection). I've reviewed quite a few of them already, and found some useful information from them. For California Births, Marriages and Deaths, I have mined quite a few of them, but there are some pending, so I will check them out. Same with the Social Security Death Index - I've done over 700, but there are 31 pending. There are Norway Baptisms, Marriages and Burials on the list now, and those may be useful. There are some English County Parish Registers on the list which should be useful. And many more! I saw the New York State Deaths, 1957-1964 further down the list. I haven't seen that database before, so I will go mine it and see what they have. For each record match, the screen above shows the information in my tree on the left, and the information in the record on the right. 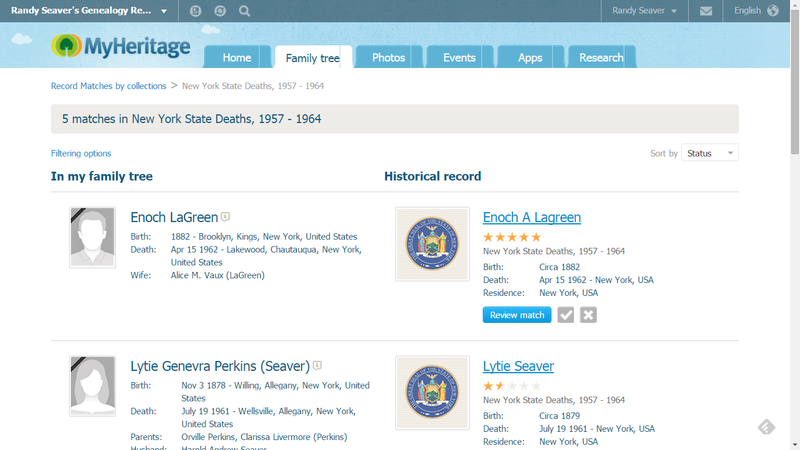 "New York State Deaths, 1957-1964," indexed database, MyHeritage (http://www.myheritage.com), Enoch A. Lagreen entry, 1962. 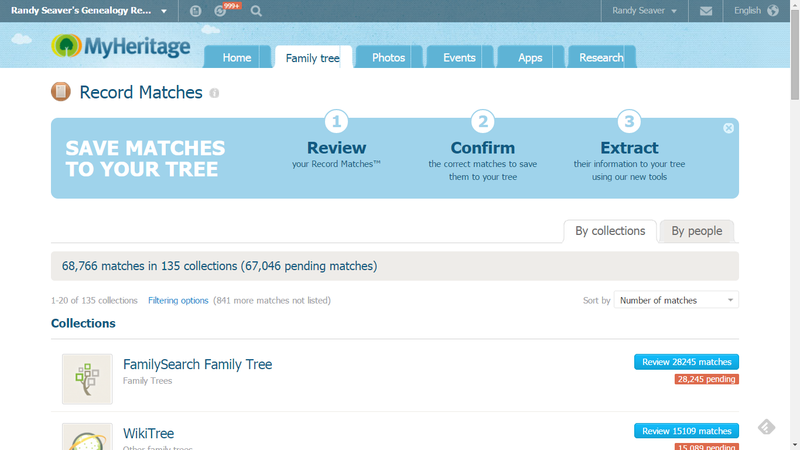 On MyHeritage, I can Confirm the match if the record correctly matches the person in my tree. I will do that and reduce the Match count for this database. 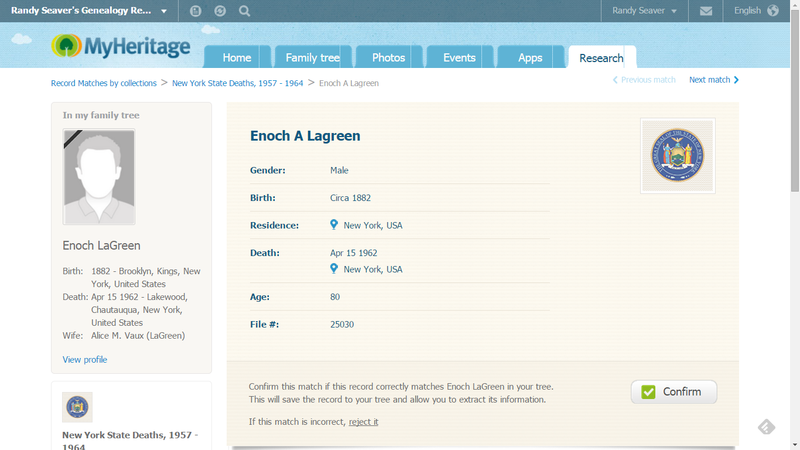 Then I can decide which data, and the source, to add to the person in my MyHeritage tree. Finally, I can Save the Record to my tree person. I did this process for the five matches in this database and now it shows that there are 0 pending matches. On to the next database! As with every record provider, I try to search for the record collections that I have not mined before, such as the New York Deaths collection above. I also searched this record collection for Seaver persons, and there were 34 matches. I was able to add information (death date, death place, and source citations) to my RootsMagic database for about 30 individuals. I don't know why MyHeritage didn't find them in the Record Matches - perhaps I have added many of them in the four years since I uploaded this tree to MyHeritage. Zachariah Hildreth (1754- ca 1820) is #72 on my Ahnentafel list, my 4th great-grandfather. He married in 1777 to #73 Elizabeth Keyes (1759-1793). "Zachariah Hildreth, son of Zachariah Hildreth and Elizabeth his wife was born January ye 13th 1754." * Hildreth, Zachariah, Boston. List of men mustered by Nathaniel Barber, Muster Master for Suffolk Co., dated Boston, June 8, 1777; Capt. Langdon's Co., Henry Jackson's Regt. * Hildreth, Zachariah. 2d Lieutenant, Capt. 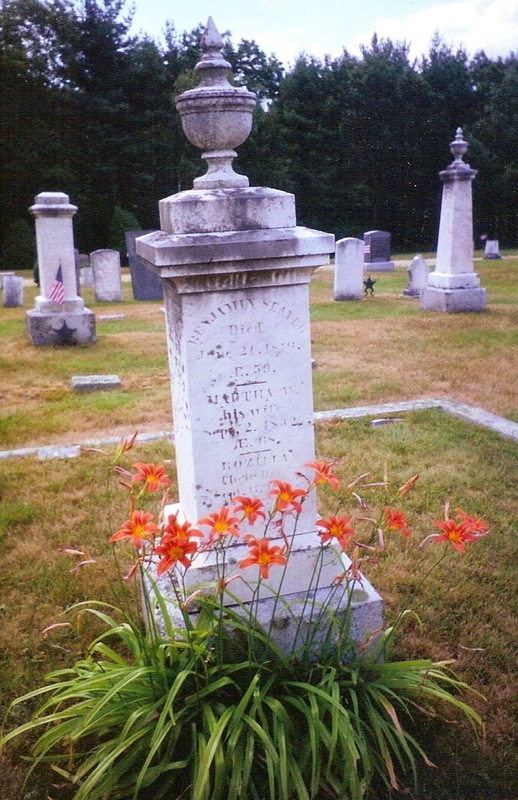 Zachariah Wright's 8th (2d Westford) co., 6th Middlesex Co. regt. of Mass. militia; list of officers chosen by the several companies in said regiment, as returned by Jonathan Reed and others, field officers; ordered in Council, April 24, 1776, that said officers be commissioned; reported commissioned April 24, 1776. * Hildreth, Zachariah. corporal, Capt. Isaac Wood's co., Col. Jonathan Reed's regt. of guards; joined April 1, 1778; service, 3 mos. 4 days, at Cambridge; enlistment, 3 months from April 1, 1778; also, same co. and regt. ; muster rolls dated Cambridge, May 9, and June 1, 1778; enlisted March 31, 1778. There was a Zachariah Hildreth who resided in Boston who is probably the man with the first entry. There are several muster rolls available for this Sergeant Zachariah Hildreth in Colonel Henry Jackson's Regiment. A Sons of the American Revolution application for George Henry Woolley (dated 1922) claims that Zachariah Hildreth (1754-1829) was a 2nd Lieutenant of Capt. Zach. Wright's Company of the Middlesex 6th Regiment. Another Sons of the American Revolution application, by Samuel Hildreth Emerson, claims the same service for Zachariah's father, Zachariah Hildreth (1728-1784) of Westford, Massachusetts. I think that the third entry in the Soldiers and Sailors book is Zachariah Hildreth (1754-1820) rather than the second entry. I think that this is much more likely - that a 48 year old man would serve as an Officer rather than a 22 year old man. In 1786, during the Shays Rebellion in Massachusetts, a number of men in Townsend were listed as sympathizers, and about 30 of them marched to Concord from Townsend under Lieutenant Peter Underwood. Zachery Hildreth is on the list. The History of Middlesex County, Massachusetts book describes the action. "Zachariah Hildreth was a farmer, a cooper, and a military man, who was elected Captain of the militia in 1790, and held that office until 1796." * one female aged 26-45. * one female aged over 45. The Sons of the American Revolution application for George Woolley states that Zachariah Hildreth died 17 March 1829 in Townsend. However, the Townsend Vital Record book gives the date as 1819 in the burial records. "Zacheus" Hildreth was enumerated in the 1820 U.S. Census as a male over age 45. There is no conclusive information about his death date. "Pratt, Benanuel, & Zachariah Hildreth, 1819 (S.A.R. marker)"
No probate records were found for Zachariah Hildreth in the Middlesex County, Massachusetts probate records.
. Vital Records of Westford, Massachusetts to the Year 1849 (Salem, Mass. : The Essex Institute, 1915), Births, page 58, Zachariah Hildreth entry.
. Massachusetts, Town and Vital Records, 1620-1988, digital images, Ancestry.com (http://www.ancestry.com), "Westford Births ,Marriages and Deaths," page 71 (penned, image 42 of 1750), Zacharish Hildreth birth entry, 1754.
. Henry C. Hallowell (editor), Vital Records of Townsend, Massachusetts (Boston, Mass. : New England Historic Genealogical Society, 1992), Marriages, Book 1, page 23, Zachariash Hildreth and Elisabeth Keys entry.
. Massachusetts, Secretary of the Commonwealth, Massachusetts Soldiers and Sailors of the Revolutionary War (Boston, Mass. : Wright & Potter Printing, 1896-1908), Volume 7, page 860, Zachariah Hildreth entries.
. U.S. Sons of the American Revolution Membership Applications, 1889-1970, online database and images, Ancestry.com (http://www.ancestry.com), Illinois Society of the SAR, National Number 37388, image 438-440 of 489, George Henry Woolley application, 1922.
. "Ancestor Search," indexed database, DAR, Daughters of the American Revolution (http://www.dar.org : accessed 25 March 2015), Ancestor # A0155571, Zachariah Hildreth.
. H. Clay Williams, Biographical Encyclopaedia of Massachusetts of the Nineteenth Century, Volume 2 (Boston, Mass. : Metropolitan Publishing and Engraving Company, 1883), page 312, Milo Hildreth sketch.
. 1790 United States Federal Census, Population Schedule, Middlesex County, Massachusetts, Townsend, Page 610, Zachariah Hildreth household; digital image, Ancestry.com (www.ancestry.com), citing National Archives Microfilm Series M637, Roll 4.
. History of Middlesex County, Massachusetts : with biographical sketches of many of its pioneers and prominent men (Philadelphia: J.W. Lewis & Co., 1890)., Volume 1, page 598, 1793, Zechariah Hildreth entry.
. "Massachusetts and Maine 1798 Direct Tax," indexed database and digital image, American Ancestors (http://www.americanancestors.org), Volume 11, Townsend, Massachusetts, Page 49 of 720, Land, Lots, Buildings and Wharves, Zachariah Hildreth listing.
. 1810 United States Federal Census, Population Schedule, Middlesex County, Massachusetts, Townsend, Page 295, Zachariah Hildreth household; digital image, Ancestry.com (http://www.ancestry.com), citing National Archives Microfilm Series M292, Roll 20.
. Henry C. Hallowell (editor), Vital Records of Townsend, Massachusetts, Deaths, page 359, Zachariah Hildreth entry (with SAR marker).
. History of Middlesex County, Massachusetts : with biographical sketches of many of its pioneers and prominent men (Philadelphia: J.W. Lewis & Co., 1890)., Volume 1, pages 584-586, Zachery Hildreth entry.
. "Massachusetts and Maine 1798 Direct Tax," indexed database and digital image, American Ancestors (http://www.americanancestors.org), Volume 11, Townsend, Massachusetts, Page 10 of 720, Dwelling Houses, Zachariah Hildrith listing.
. 1800 United States Federal Census, Population Schedule, Middlesex County, Massachusetts, Townsend, Page 1295, Zach Hildreth household; digital image, Ancestry.com (http://www.ancestry.com), citing National Archives Microfilm Series M32, Roll 17.
. 1820 United States Federal Census, Population Schedule, Middlesex County, Massachusetts, Townsend, Zacheus Hildreth household, online database, Ancestry.com (http://www.ancestry.com), Page 567, citing National Archives Microfilm Publication M33, Roll 51.
. Henry C. Hallowell (editor), Vital Records of Townsend, Massachusetts, page 30, Zech. Hildreth and Nabby Heart marriage entry.